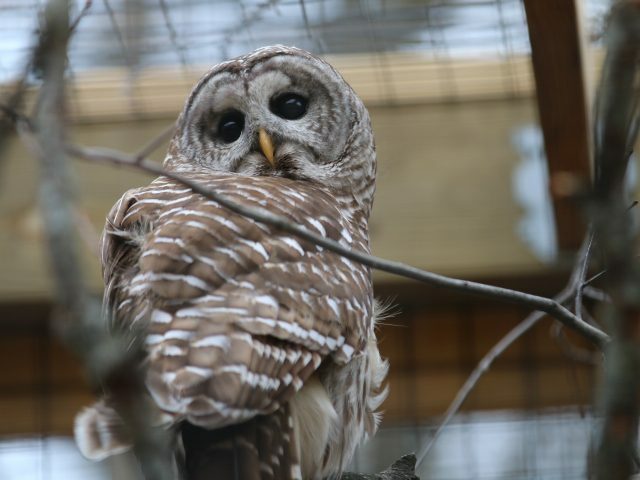 Barred owl’s habitat is dense, mature forest, usually near water where they are year round residents. They are widely distributed throughout Canada, the United States and Mexico. Females are larger than males, although coloration is similar. The owl has a grey-brown head with dark line that circles the face. They have a pale yellow bill and big brown eyes. 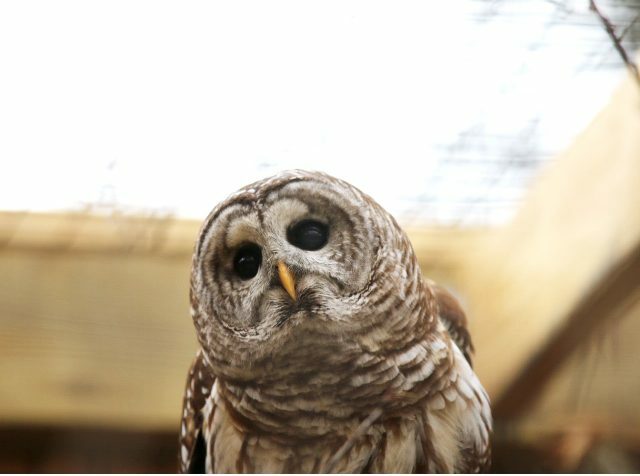 The barred owl’s legs and feet are feathered, and you can se their large talons under the feathers. 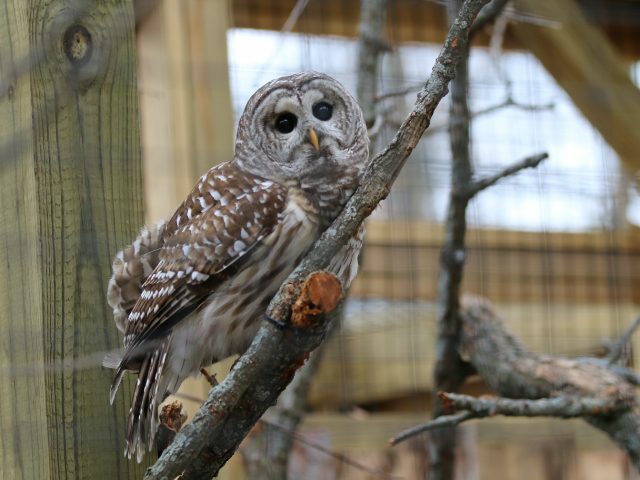 Barred owls are usually live alone outside of the breeding season. During breeding season they form monogamous pairs that stay together for life. They nest in tree cavities that are at least 20 feet up in the air and lay 1-5 eggs, incubated by the female. Both parents feed the young. Owlets leave the nest at 4-5 weeks. 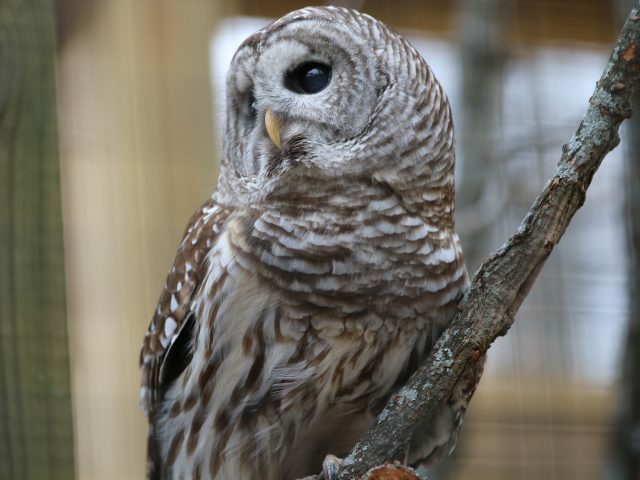 Barred owls are named for the bars found on their chest. You can help the species by creating nesting boxes at home! Check out these plans. 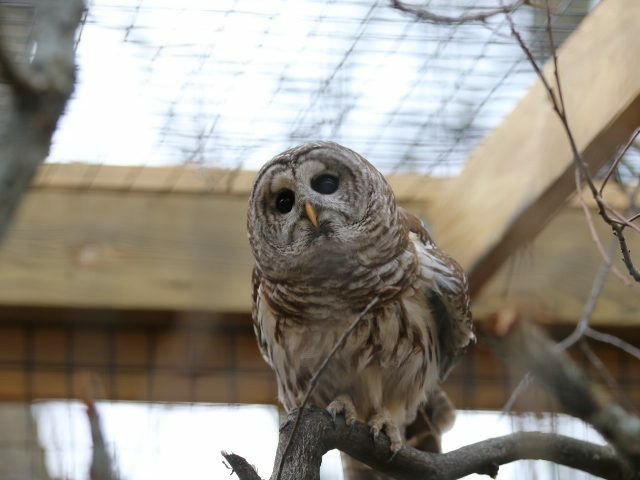 Our barred owl is a rehab bird that came to us from Michigan State University. He was under the care of the vet department and could not be released due to his injuries. We believe that he was born in 2012. Length: 17-20 inches with a wingspan of almost 4 feet! (unto 42 inches). Male Males weigh around 1.4 pounds and females weight around 1.7 pounds. 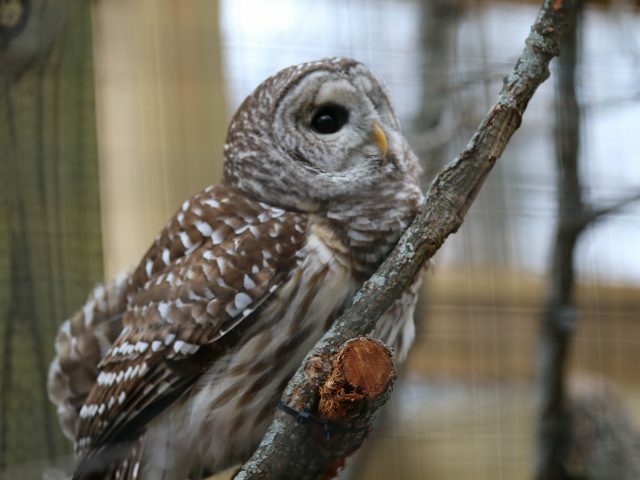 Barred owls are opportunistic hunters, hunting small mammals including mice, squirrels, and rabbits, birds, insects, frogs, and occasionally fish.